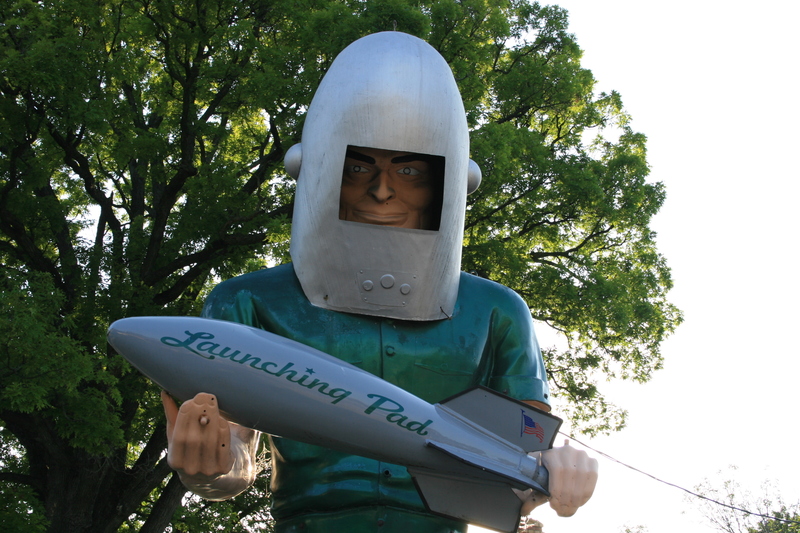 Probably the most famous muffler man standing today is the Gemini Giant in Wilmington, IL. He stands in the parking lot of the Launching Pad Restaurant and has been for the last 48 years. 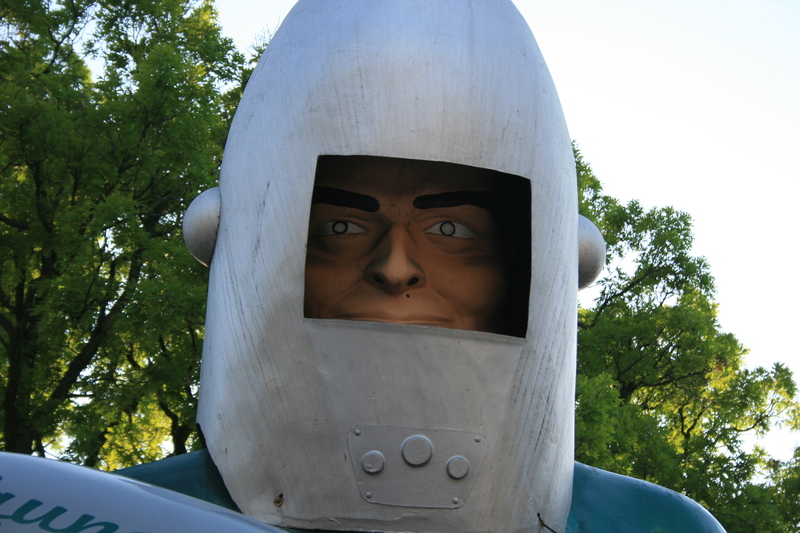 I’ve covered the different versions of muffler men on this blog and in my youtube series “American Giants” and the gemini giant belongs the rarest version, the spaceman. In the mid 60’s we were in them middle of the space race and in June of that year Gemini 4 was launched, it was the second manned space flight in NASA’s project Gemini. As these events were unfolding in Cape Canaveral the guys at international fiberglass in California decided to keep up with the times and make a new variation to their muffler man line. And so the space man was born. In addition to the arm positions and bulging veins he was also given a space helmet and often his clothes were painted a spacy gold or green color. To my knowledge only 2 space men have ever been confirmed as being made and I have yet to see evidence of more. The first one seems to have appeared in an early add for international Fiberglass and pictures a space man with a surf board shaped sign that reads “Astro Oil Co”. The giant has on bunyan style legs with the pants tucked into the top of the boots but lacks the suspender buttons. Soon after what I believe is the same giant was moved to Coney Island and was fairly well documented there over the next few years first appearing with his helmet and then at some point it was taken off. The sign also was changed to read “Astroland” and he stood next to the giant ferris wheel. It is possible that the giant in the International Fiberglass add and the one at Coney Island are two different statues and if so then there would have been a total of 3 of these space giants that I know of to have existed. The only remaining space version standing today is the one in Wilmington and he is different in that he has on cowboy pants and what appear to be his suspender buttons appear in some kind of fabricated control panel that appear on his helmet just under the face shield. He is the only one to have received this “control panel” as far as I can tell and the other two did not have this feature. He comes with standard shoes but stands on a concrete pedestal that bares his name. 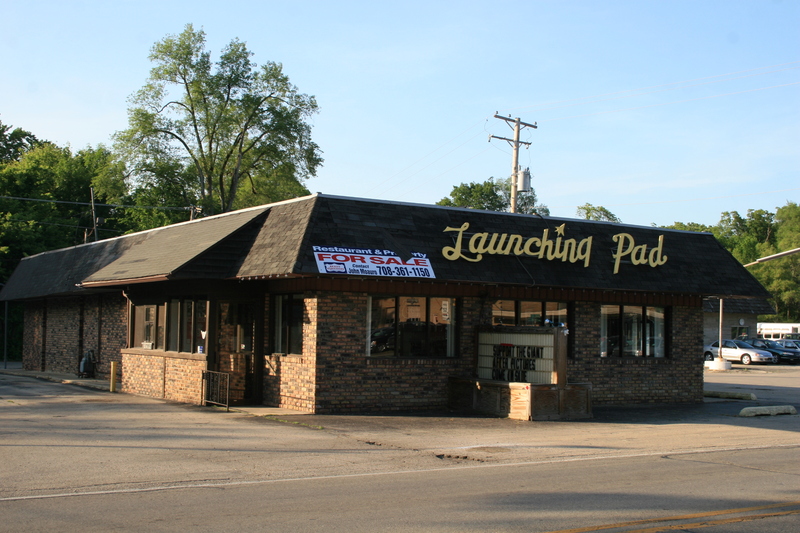 Nearby stands the Launching Pad Restaurant that has just recently closed it’s doors and is now up for sale. Brand new the Giant cost $3,500 in 1965 and that has the same buying power as $25,955.11 in todays market. So even back then that hefty giant came with a hefty price and nothing much has changed. Although owner Morey Szczecin has received dozens of offers the giant can only be yours if you buy the entire property and so far it is still for sale. 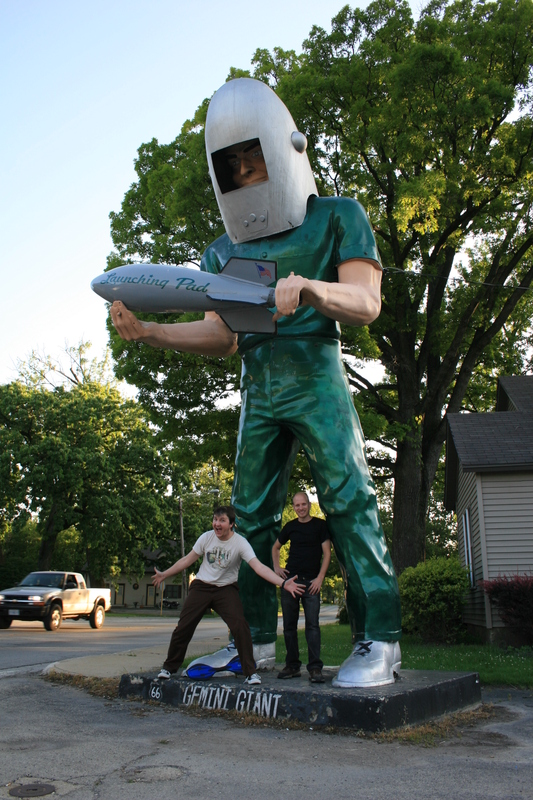 The giant has become a symbol of old route 66 in Illinois and even appeared in tourist commercials produced by the state. Hundreds of visitors still stop by to see him each year and just down the street stands a fellow International Fiberglass product, a Sinclair dinosaur. Our American Giants crew visited him in the summer of 2012 and that trip will be featured in episode #4.